Since NASCAR installed themselves within the Canadian stock car racing landscape when they acquired CASCAR in 2007, differences remain apparent when racing amongst the True North Strong and Free. The most obvious eccentricity within the NASCAR Canadian Tire Series is the compilation of road courses. Out of 13 NASCAR Canadian Tires series races in the 2010 schedule, 5 occur on road or street course. Following the opening round at Deleware Speedway where DJ Kennington drew first blood on the 2010 season, the stock car series find themselves racing on the Mosport road course for the second race on the schedule, the Vortex Brake Pads 200. Providing a large 26-car field, the starting grid was topped by 2-time and reigning NASCAR Canadian Tire Series champion Andrew Ranger making one of what will be a few visits back to Canada (Ranger is now racing within the NASCAR K&N East Series). Taking pole with a red #27 Dodge, Ranger showed little rust taking an early lead before a quick caution brought the field together again. Having started alongside Andrew Ranger for the Vortex Brake Pads 200 was the #84 Schick Hydro Chevrolet of JR Fitzpatrick. Following a 2nd place finish at Deleware where Fitzpatrick overcame an early spin-out, the young Cambridge native plans a stronger set of race laps early will allow him a one position improvement on the race results. Thanks to the early caution which wrapping up on lap 5, JR Fitzpatrick would motor around Ranger on the restart to take the race lead. A tamer race than the yellow-flag laden season opening event, the Mosport road course saw only two cautions. The second fell on lap 18 when Jarrad Whissell's #44 Ford met a wall. After several cars made pit stops including JR Fitzpatrick, the Mosport race was reset with American driver Jason Bowles leading Pierre Bourque. Driving the #11 Triad Racing Technologies Dodge driven by John Gaunt, the Ontario, California driver Bowles put on an incredible show rising from an 11th place starting spot to be a race front-runner. While JR Fitzpatrick's Chevrolet would find a way around Bowles' Dodge on lap 28, the #11 would remain near the front settling for a stunning 3rd place finish. Leading the final 22 laps, JR Fitzpatrick crossed the line first in front of Andrew Ranger for the Vortex Brake Pads 200 victory. A hard battle for 6th place became the biggest spectacle coming to the start/finish line as #17 Castro Edge Dodge of DJ Kennington held off a valiant charge from Jeff Lapcevich's Tim Hortons Chevrolet. 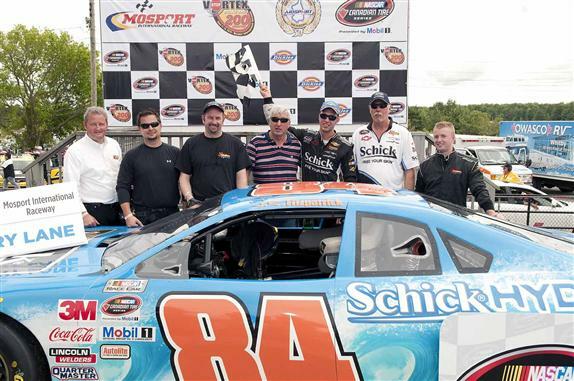 Rounding out the top-5 for the second NASCAR Canadian Tire Series race of 2010 was Scott Steckly and Kerry Micks. After two races, JR Fitzpatrick has been able to combine a win and 2nd place finish to take the series points lead ahead of DJ Kennington. Next for the NASCAR Canadian Tire Series is a return to ovals as the circuit visits Quebec's Autodrome St Eustache on July 3.